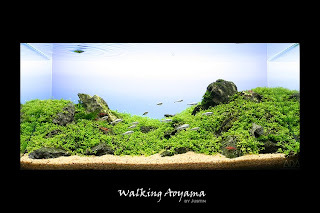 This week's aquascape is called Walking Aoyama by Justin Law. 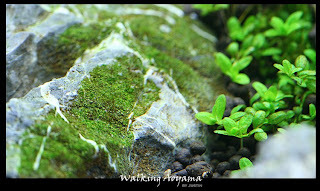 It's quite a contrast from last week's aquascape, and is more of an iwagumi style. 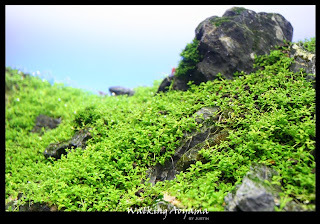 The most striking thing about this aquascape, for me at least, is the elevation. To get the substrate to stay in hills like that is extremely hard but very very rewarding if managed. 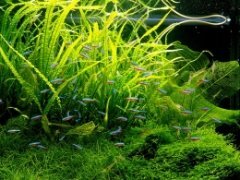 It emulates a grassy hillside and is very relaxing to look at. Hemianthus callitrichoides (HC) makes up the majority of the plants in the aquascape, with some moss hiding here and there. 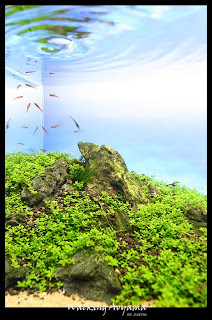 This aquascape actually inspired me to make my own iwagumi style layout using HC and rocks, and let me tell you, it isn't easy! For more pictures, visit Justin's Walking Aoyama photo album.